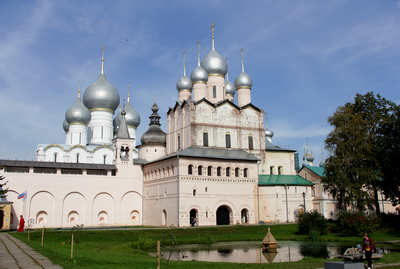 A State Museum Preserve “Rostov Kremlin” was opened as a museum of ecclesiastical antiquities on the territory of neglected and decayed Bishop’s House (second half of the XVII century) in 1883 on the Memorial Day of Saint Dimitry of Rostov who was considered as a patron saint of the museum. It was one of the first museumfication projects of the big architectural complex in Russia of XIX century, which was carried out by initiative of local communities with the assistance of the Emperor Moscow Archaeological Society, and many other companies and individual persons. A good reputation of this ancient Russian museum made it possible to collect an impressive collection which takes part not only in Rostov Kremlin exhibitions but also in travelling exhibitions in Russia and abroad. Today a large-scale restoration project of the XVII-century Livery Yard is carried out. This building will be used for exhibitions, restoration studios and fund rooms of the museum. The second half of the XVII-century Metropolitan garden was restored with the mark sign of the Gregory’s Seclusion building where Epiphanius the Wise, author of Saint Sergius of Radonezh hagiography, worked in the end of the XIV or in the beginning of XV century. More than 400 thousand of people visit the museum every year. Besides lectures and tours, workshops, quest games and toll concerts are carried out there. A “Live Old Times” Folk Festival dedicated to the Days of Slavic Written Language (May 24), Poplar Fluff Festival of Art of Arts Universities Students (July), Rostov Enamel Festival and “Rostov Performance” International Festival of Monastery Culture (22-24 August) are carried out there every year. Since 2010 the director of the museum is Natalia Karovskaya, a musicologist, candidate of culturology, specialist in campanology, author of research papers. As a teacher of the bell-ringer school of the Yaroslavl Eparchy she trained several tens of bell-ringers who are working now all over the country. She’s also an author of the new toll named Kirillovsky. She’s been a professor of culturology at the Yaroslavl State Teacher Training University named after Ushinsky. She’s one of the authors of the concept of the “Transfiguration” International Arts festival. In 2011 N.S. Karovskaya has built up a concept and carried out the 1st International Festival of the middle-aged culture, which took its name from texts of saint bishop Dimitry of Rostov – “Rostov Spectacle”. In the framework of the festival various performances of leading groups playing sacred music from different European countries take place, icon-painting golden-embroidery workshops are given and a book fair is being held. As envisioned by N.S. Karovskaya, a young composer from Moscow Andrey Doynikov wrote “Rostov suite” for symphony orchestra, mixed and junior vocal ensembles, three female voices and principal performance dedicated to the 130th anniversary of the Sate Museum Preserve “Rostov Kremlin”. 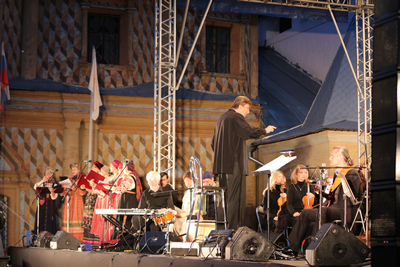 On the 30th of August 2013 in the framework of the 3rd International Festival of monasterial culture “Rostov Spectacle” within the walls of Rostov Kremlin this suite was rendered by the symphony orchestra of the Theatre Novaya Opera (New Opera) (band-master – Dmitry Volosnikov), by the Musician community “Etnosfera” (Etno-sphere), by the ensemble of ancient Russian sacred music “Sirin” and also by the folk music group “Veretentse”. Suite composition is based on the texts of saint bishop Dimitry of Rostov, who has left a rich literary heritage. Among these works are: the Worshipping Virgin Mary (“Venite adoremus” – come to adore), the poem “Tara”, poem of repentance “Death of the damnedest”, Christmas poem “I see sacrament”. The music of suite represents the combination of spiritual and folk traditions, classical symphonic music and modern styles of jazz and fusion. Theme music of leading singers, authentic folk songs and spiritual poems are interlaced in this music work. In March 2014 “Rostov suite” was executed on the stage of the Moscow Theatre “Novaya Opera” (New Opera) in a new way with a modified composition, new parts and leading singers. In the festival “Inter-museum” in June 2014 the project of N.S. Karovskaya “Rostov suite” was conferred a special reward by the Russian Committee of the International Council of Museums (ICOM of Russia) “Pro-motion across the museum map” for the best project, aimed to develop (promote) native cultural and environmental heritage as part of the international museum context.